Snapshots of Shanghai showing a day in the life of the expo host. 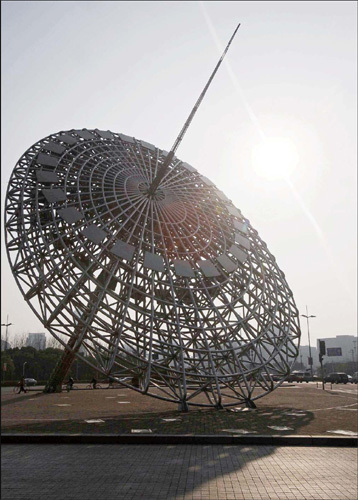 Oriental Light, a sculpture of an ancient Chinese sundial based on an idea by French architect Jean Marie Charpentier, dominates the landscape in Century Avenue of Pudong. New landmarks such as this are just some of the attractions for the anticipated 70 million expo tourists from May to October. Shanghai only has 100 days left in which to iron out all the kinks and make sure the city is expo-friendly in order to achieve its goals. By playing host to the 2010 World Expo, Shanghai is looking to roll back its glorious past, consolidate the world's confidence in overcoming the economic meltdown and push forward with an already breathtaking transformation in this city of 18.6 million. With an official budget of 28.7 billion yuan ($4.2 billion), Shanghai intends to carve a place in expo history by topping milestones set by previous World Expos, such as the 1893 Columbia Expo, which introduced the Ferris wheel. "For China, the World Expo is a testament to the nation's rapid growth in the past 30 years. It is also a symbol of the nation's power," said Wang Jinzhen, vice-chairman of the China Council for the Promotion of International Trade (CCPIT). It will also fuel Shanghai's economic expansion, upgrade the restructuring of local industry, strengthen its integration with nearby economies, and propel the city's urban development, he added. It is estimated that the expo will help the city's economy grow by 2 percent this year. 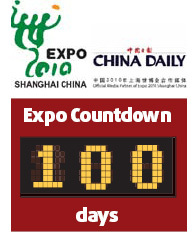 Revenue from the expo economy will amount to 100 billion yuan and thousands of new jobs will be created. Shanghai has latched onto the expo as a chance to establish a powerful global profile in the same way the Beijing Olympics put a spotlight on the nation's capital in 2008. The city is ready for the cultural gala, and not just because of the huge amount of money the government is pouring into new landmark structures. Rather, it marks a shift in the city's psyche from that of nervous upstart to one full of confidence about the future. The six-month party is also advancing a larger government goal of bolstering the economy and turning Shanghai into a global financial and shipping center and a world-class city in the same league as New York and London. When the event kicks off in May, Shanghai will have two new airport terminals and a subway system longer than its counterparts in New York and Tokyo. At the 5.28-sq-km expo garden, upwards of 800,000 visitors are expected to punch their tickets at the gate every day - equivalent to dropping a different European city into the middle of Shanghai seven days a week.